With powerful new unique characters and events for the Great Houses of Westeros, the 60 cards (3 copies each of 20 different cards) in Where Loyalty Lies offer tremendous deck-building options and pushes the development of the A Tale of Champions cycleâ€™s new Joust and Melee keywords as well as its focus on the unique personalities most likely to attend tournaments. Fans of House Lannister and their machinations should be particularly pleased by the new characters raising their banners for their favorite House. Where Loyalty Lies features 12 unique characters, including new versions of existing characters and exciting new characters like The Mountain that Rides, Ser Gregor Clegane, one of the most wicked and fearsome villains from George R. R. Martinâ€™s A Song of Ice and Fire. 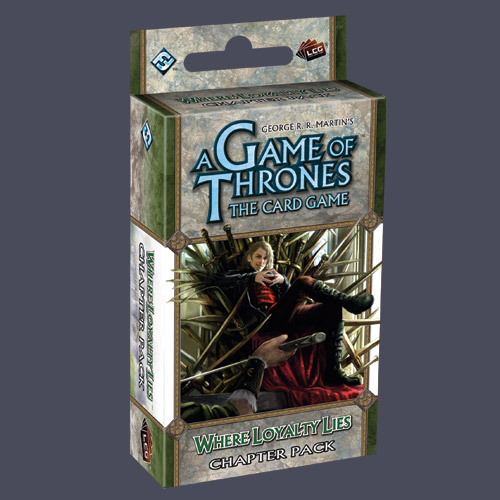 An A Game of Thrones: The Card Game core set is required to play. Contains cards 61-80 of the A Tale of Champions series.